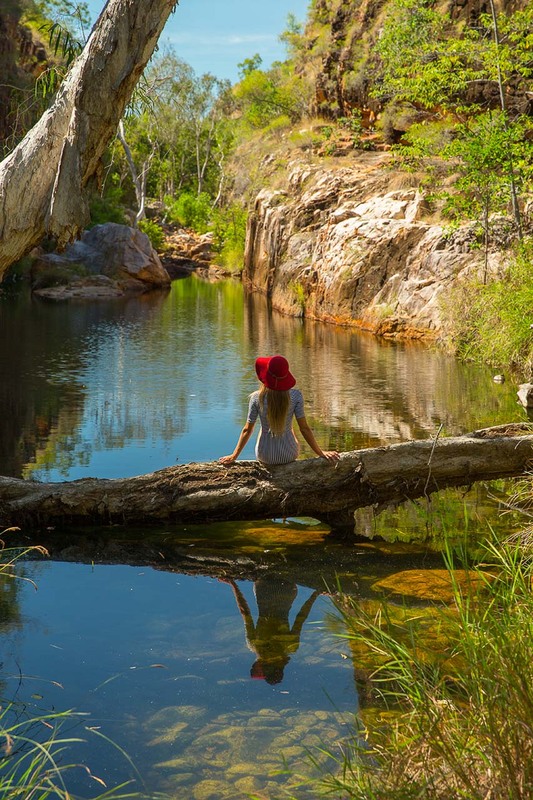 WE EXPLORED some of The Kimberley in Australia’s last true frontier: The Kimberley in 24 stunning photos, but the operative word there is ‘some.’ Roads – even unpaved tracks – are few and far between. With the coastline, creeks, and tributaries that characterise this remote corner of Western Australia much of the area is inaccessible except by boat or air. Due to the logistics, visiting this area in-depth tends to be expensive (unless you happen to own a yacht). 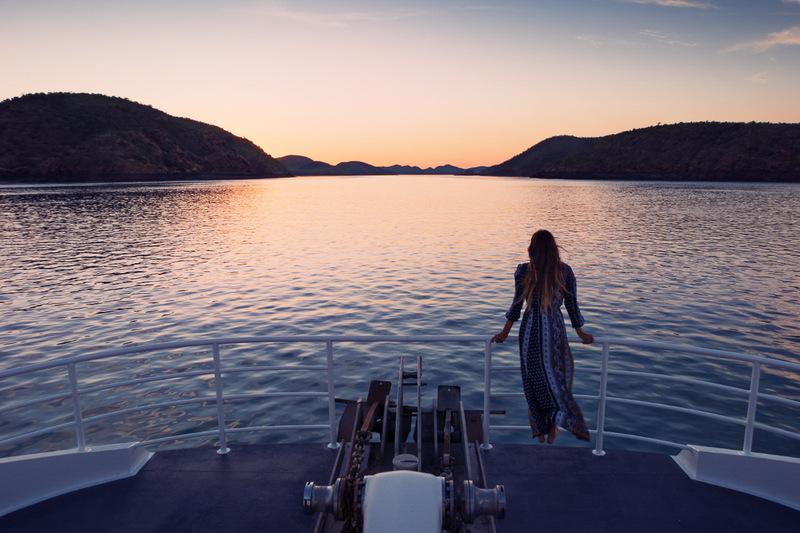 Odyssey Expeditions helped me out, hosting me on one of their many itineraries of varying budgets, with lengths of up to 28 days. 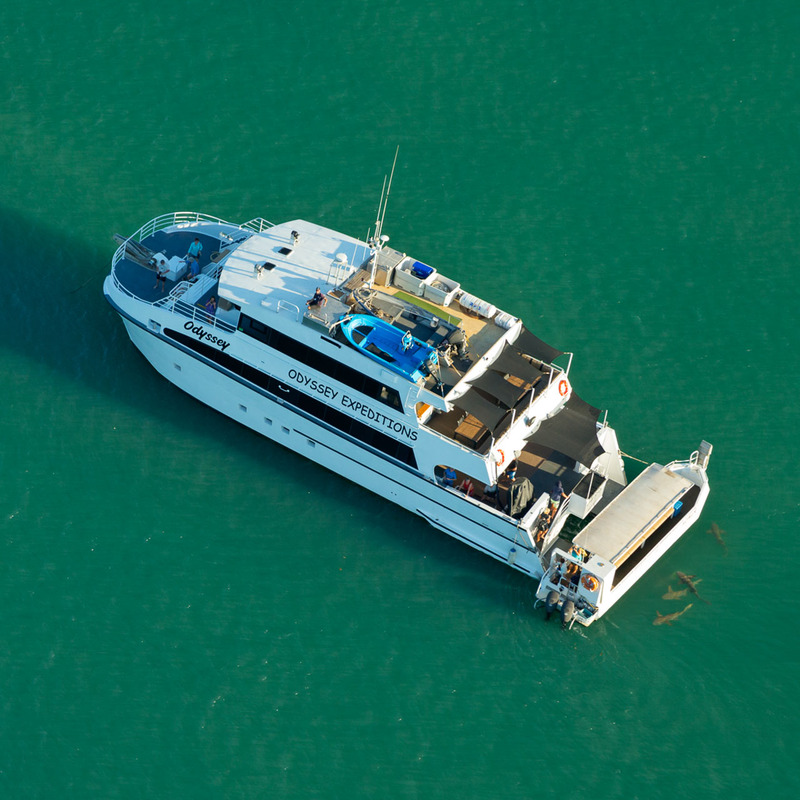 I took the nine-day fly/cruise option, heading northwest by catamaran from Broome on the SW coast of the Kimberley to Naturalist Island. 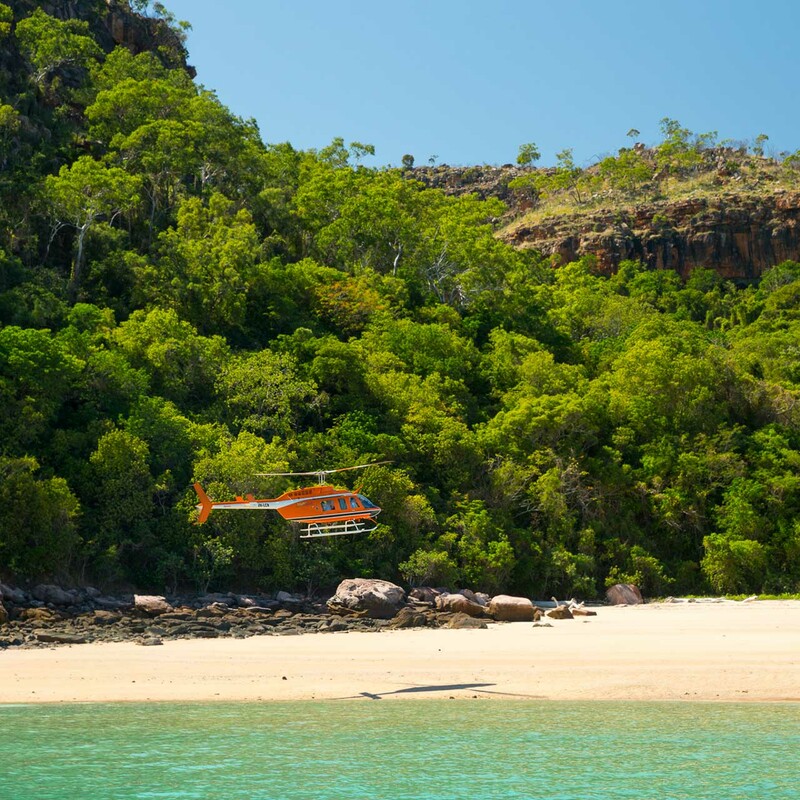 Here, a helicopter was waiting to show us the stunning Mitchell Falls and other coastal features from above, en route to the Mitchell Plateau airstrip, where a light aircraft met passengers for the next leg, then back to Broome. 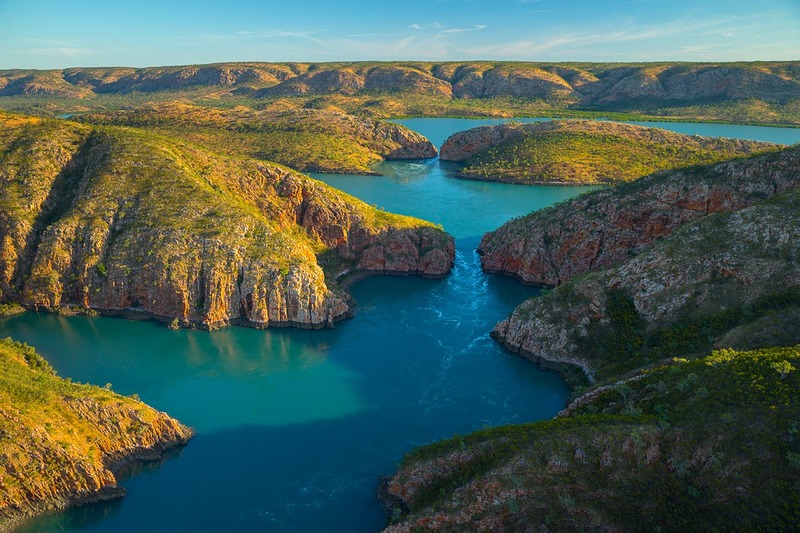 When David Attenborough describes Horizontal Falls as “one of the greatest wonders of the natural world” you know we’re talking about something rather spectacular. 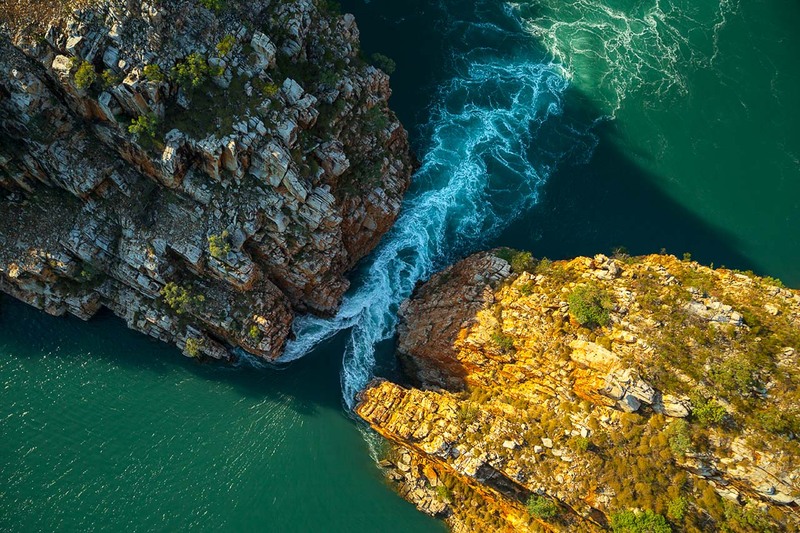 The ‘pinch rapids’ are formed between two gaps in the McLarty Range, when huge tidal differences of up to 10.8 metres (35 foot+) result in a build up of seawater on one side as the tide changes. The bottleneck produces waterfalls up to 5 metres high on the biggest of tides between the ancient, vivid, multi-coloured sandstone, siltstone, shale, dolomite, and quartzite cliffs. The falls are best seen from both water level (a specially adapted, high powered boat is necessary to battle the flow) where one can really appreciate the details and varied textures and from the air, and, ideally, by helicopter nearing sunset. I was fortunate to have a first class heli musterer pilot — essentially a cowboy that rounds up cattle by helicopter, often bringing the rotor blades to within a couple of metres of the ground. He managed to put that machine into positions that appeared to defy physics. Without elaborating too much, I will say that we are talking about a helicopter with no doors, and I was, on several occasions, suspended by the seatbelt – no part of my body in contact with the seat – with the heli at 90 degrees (and beyond) to the water. I recommend Googling ‘aerial helicopter mustering’ — those with heart conditions need not apply. Few animals inspire more respect (fear) amongst Australians than the ‘Salty’ and they featured prominently in the safety briefing the day we boarded Odyssey. Saltwater crocodiles are amongst the wiliest of hunters, so adept, that their design has remained almost unchanged for millions of years and I can tell you, there was something both fascinating and unnerving about the patience they displayed whilst they lurked around our boat, almost waiting for someone to get too close to the water, or – God forbid – slip overboard. Large adults can weigh over a tonne and reach 7 metres (23 ft) in length. 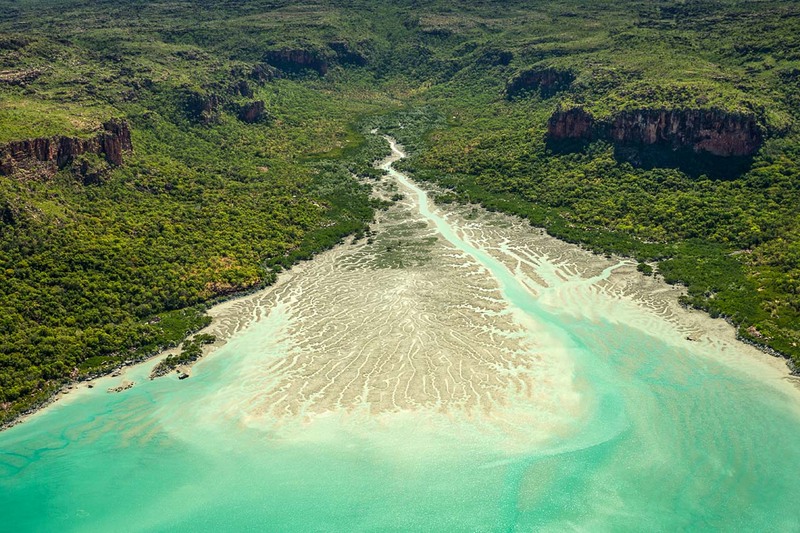 Swimming in the brackish waters surrounding The Kimberley’s mangroves is absolutely out of the question and given the animal’s fearsome stealth, it is recommended one remain out of striking distance when standing near the water’s edge. 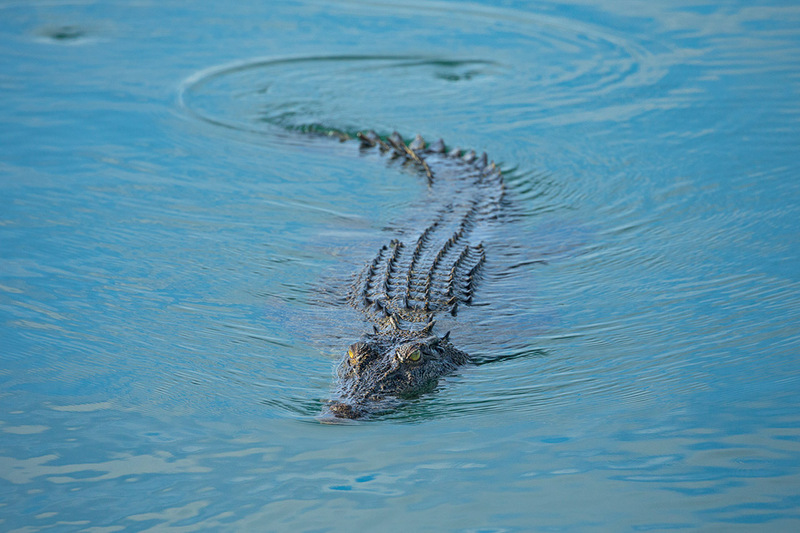 Even swimming in clear water carries a risk in many places, indeed it should be noted that saltwater crocodiles have been sighted well out to sea and have been recorded (using radio tags) travelling several hundred miles across oceans. It struck me, during several conversations, that locals are less fearful of Great Whites and Tiger Sharks than they are of the ‘Salty’, which put things squarely into perspective. 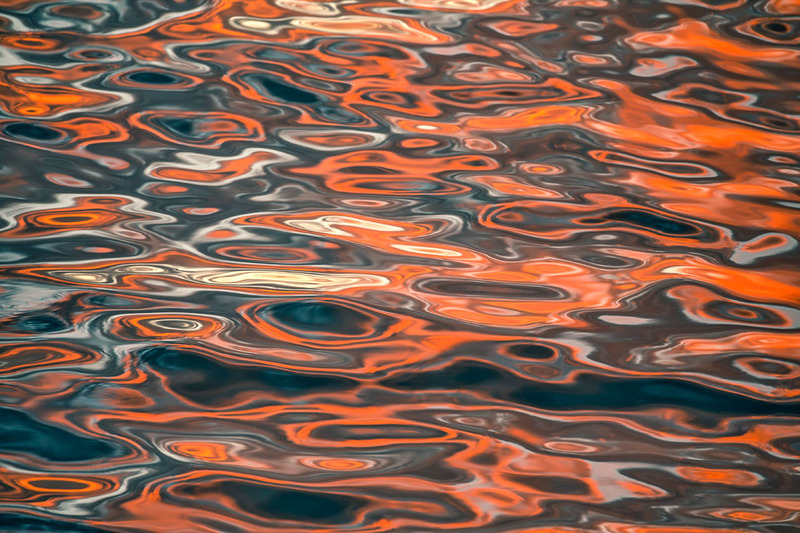 The magical mirror of a windless evening on the river, ideal conditions for flawless reflections. 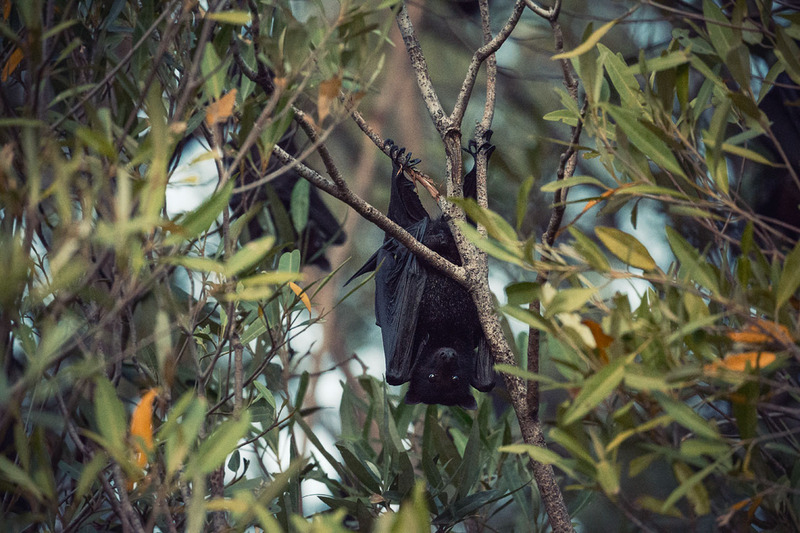 Black flying fox or fruit bat (Pteropus alecto), roosting in mangrove swamp. 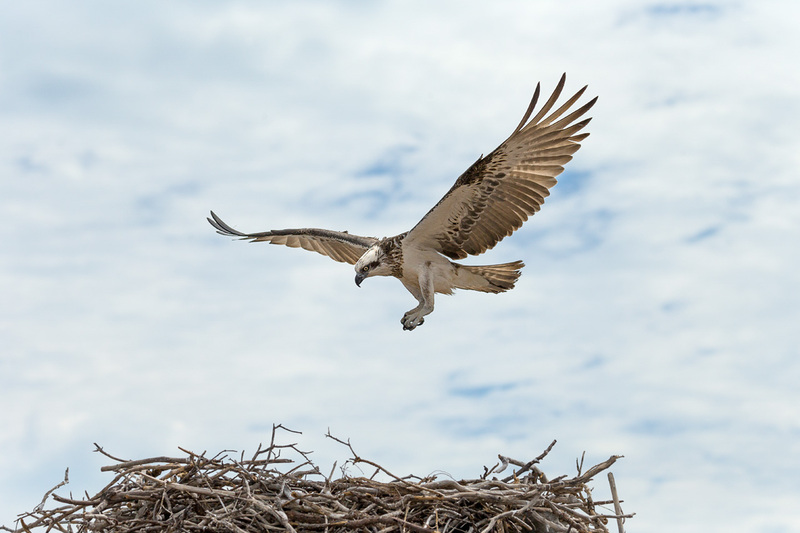 Nesting Osprey (Pandion Haliatus), coming into land. 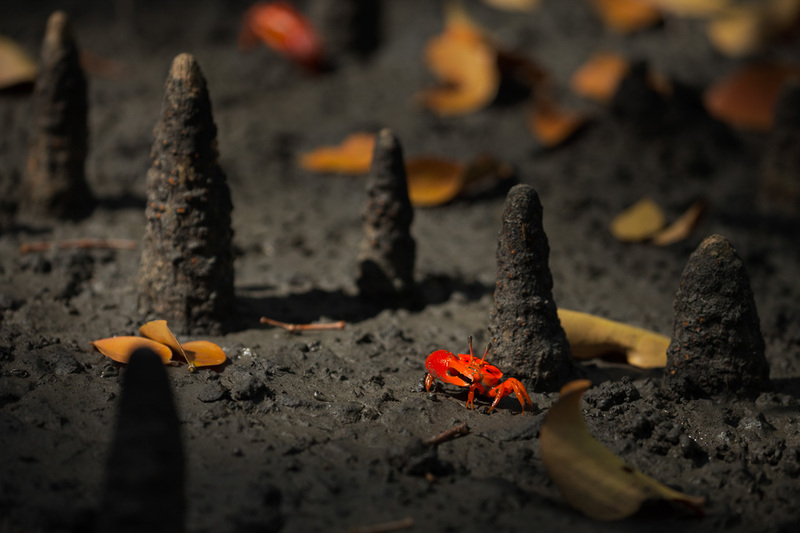 The Flamed Fiddler Crab (Uca flammula) amongst mangrove roots. 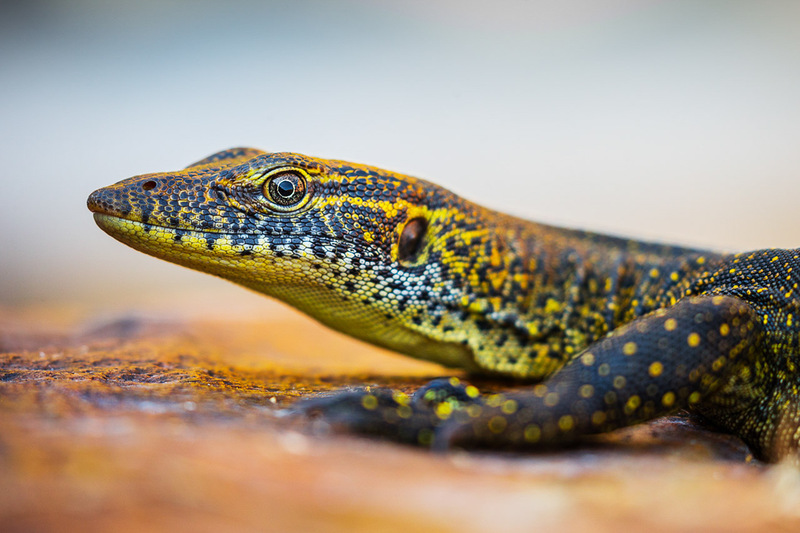 Mertens’ water monitor (Varanus mertensi) is an apex predator in small watercourses and an increasingly rare sight since the introduction of the highly poisonous cane toad. The non-native toads look like an inviting meal, but sadly spell death to any unsuspecting lizards that prey on them. The more remote parts of The Kimberley, where the toads have yet to reach, might well be the last bastion of this magnificent reptile. 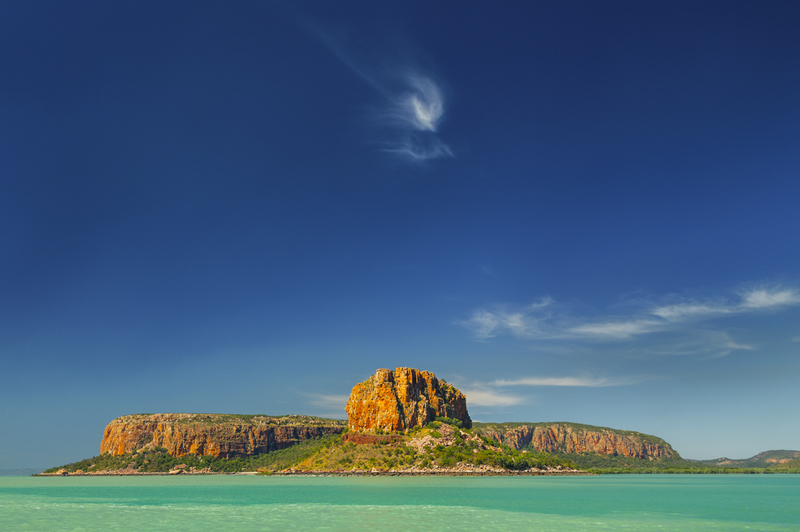 Generally speaking, The Kimberley has a tropical monsoonal climate. April to November (dry season) is the time to visit; there is barely a drop of rain and daytime temperatures are very pleasant. Conversely, wet season is one of extreme weather: Cyclones are not uncommon and temperatures can be unbearable, often above 40°C (104°F) and known to reach 48°C (118°F). Add in suffocating humidity and torrential rains and you’ll probably agree — wet season is best left to the locals, or storm chasers. The above shot was taken on the first afternoon. 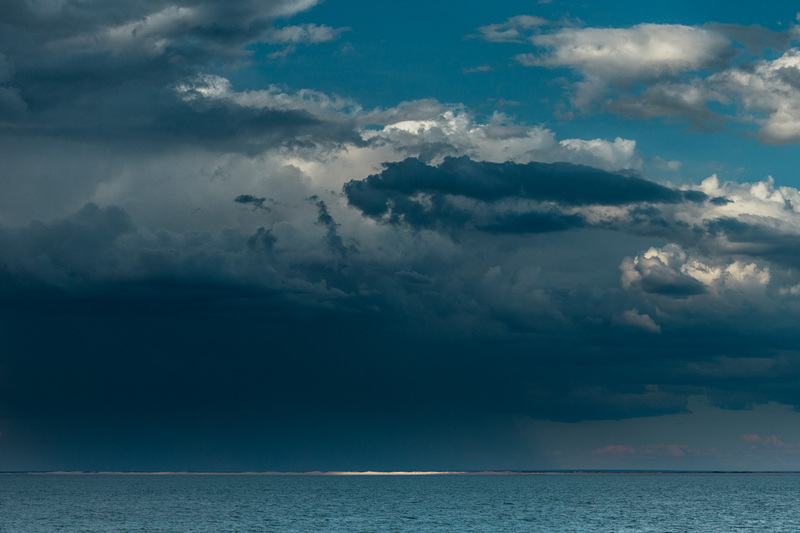 It was the only rain I saw during my time in The Kimberley and although the days of unbroken blue skies were a treat for this Brit, I couldn’t resist the brooding clouds and light picking out the brilliant white sand of this secluded beach. Our home for the duration, replete with launches, tender (‘Homer’) and omnipresent sharks. 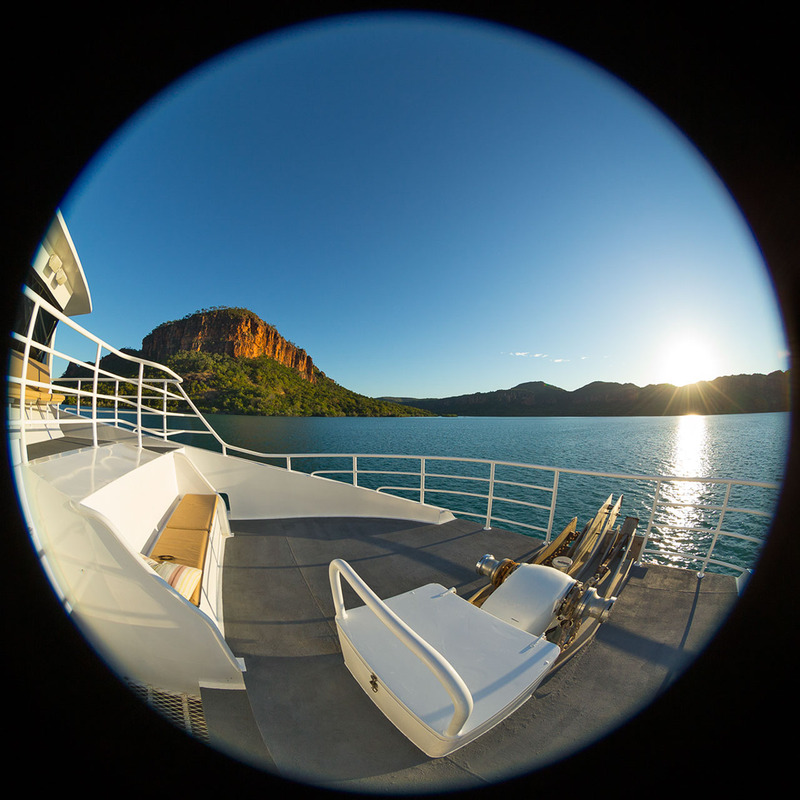 It’s hard to think of a better night’s sleep than that afforded on the deck of ‘Odyssey’: utter silence, a gentle breeze, the milky way, very few insects and waking to the warming glow of The Kimberley sun on one’s face. Heaven. 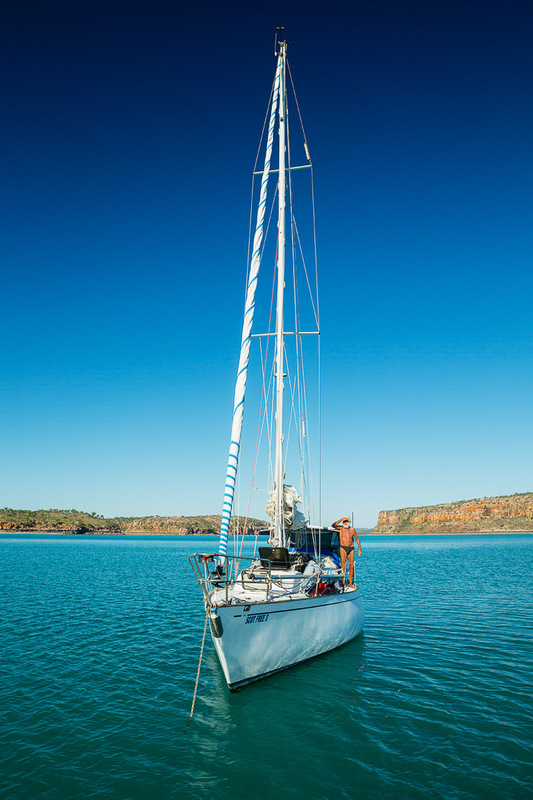 Originally used as a freshwater supply for remote mining operations in the 1950’s, the large tanks and makeshift dock were left abandoned until intrepid yachties Phil Wray and Marion Smart sailed in around 1994 and decided to make the place home. Hundreds of kilometres from civilisation and with no access, except by boat or helicopter, the couple crafted a remote paradise, converting one of the old freshwater storage tanks into a swimming pool and building and nurturing a wonderfully shady tropical garden with fruit trees aplenty. They lived there for nearly twenty years, rarely wearing more than underwear and often preferring to go naked, the odd passing boat their only link with the outside world. Marion’s death in 2012 heralded a return to the high seas for Phil and their friends; Shelley and Mal took custody of the beautiful spot, which they maintain to this day. Above, good friends Liss Connell, Grace Picot, and Pauly Vella enjoy a reviving dip in the shaded pool. A couple of days after our visit to Silver Gull Creek, we serendipitously ran into Phil aboard his new vessel, the aptly named “Scot Free II” (I believe Marion and Phil’s first yacht was number I). With his shock of white hair and weathered skin, wearing nothing save a pair of speedos and a large pearl around his neck, he was the vision of a true castaway — not a young man, but showing no signs of slowing down. We had a quick yarn before sailing on and I couldn’t help wondering if he ever felt lonely, how long he’d stay at sea for and how many other people there are in this world like Phil? The modern world is not for every one and I often yearn for solitude and silence, away from the madding crowd, but truth be told, after a few decent spells alone in the wilderness, I now know I need to be around people – at least from time to time – and haven’t got the guts to go fully feral. Clearly Phil is cut from a different cloth and something tells me that he will be just fine alone. No doubt he misses Marion, but he’ll sail till he can sail no more, content to be living in another era. 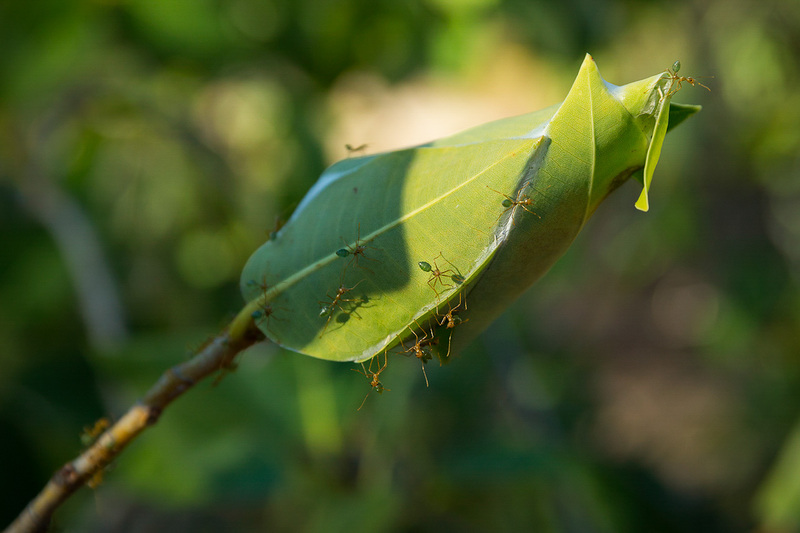 Nests are well camouflaged, a wonderful and beautiful example of integrating with the environment: adult ants pull several leaves together, sealing them with a white sticky compound produced by the ant’s larvae. The ants are The Kimberley’s answer to sherbet, but a little more nutritious, being a good source of protein and vitamins. I was a little hesitant as they can be quite aggressive when threatened (notice their stance in the picture), but eventually grabbed one and ate its abdomen. I can honestly say it was a treat and reminded me of the sour sweets (candy) of my childhood; the presence of Vitamin C was obvious. I would quite happily eat them in a survival situation. On several occasions, upon mooring, sharks would appear at the stern, drawn by the whirr of the engines. Gregarious and relatively docile, they let me get within a foot or two (less than a metre) to photograph them. 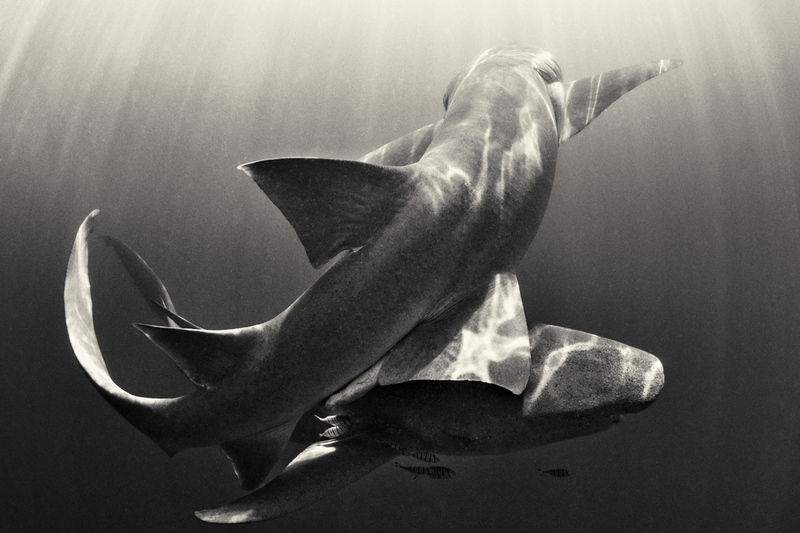 They seemed quite tactile, often swimming close by, rubbing up against each other. They are unique in the shark world in that they feed using strong suction force to extract prey from crevices in the reef. Most days we would take our tender, Homer, into secluded creeks and trek up to fresh water swimming holes, these are just a couple of the peaceful havens where we idled away a few hours. Liss Connell, appreciating the rock formations in the towering cliffs as we cruise to another destination too shallow (or narrow) for Odyssey, but just right for the tender. 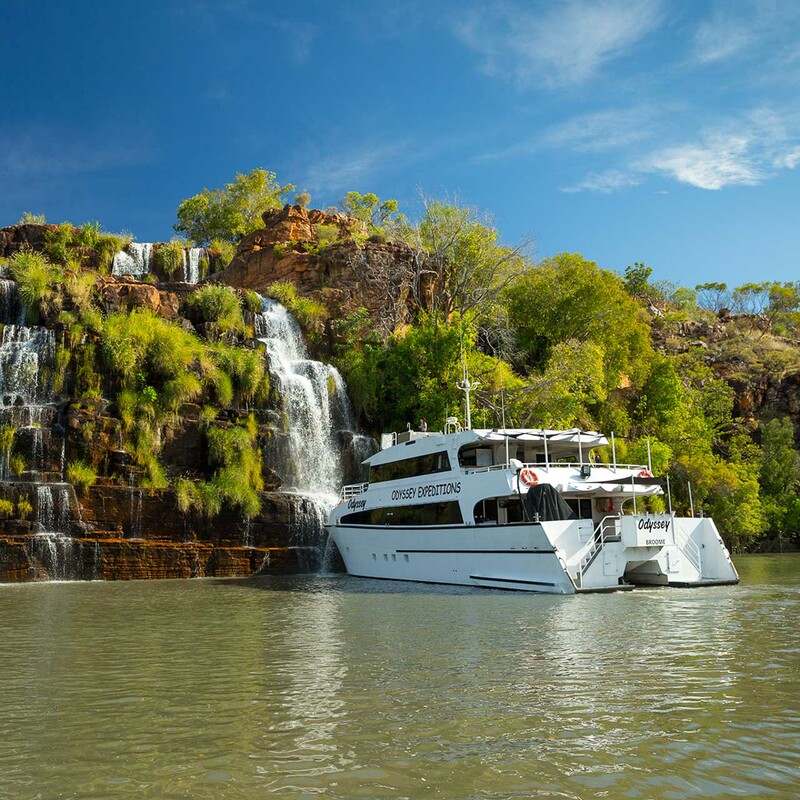 Something I’d never anticipated was parking a large boat under a waterfall, but that’s exactly what our skipper, Mark Raissis, did, deftly nosing the bow of Odyssey under the stunning King Cascades so we could take a freshwater shower. King Cascades has a sinister and gruesome secret: on March 29th, 1987, Ginger Meadows, an American model — inspired to visit The Kimberley after watching the movie ‘Crocodile Dundee’ — was eaten alive by a large saltwater crocodile at the foot of King Cascades, a day before her 25th birthday. Meadows and a friend, Jane Burchett, were confronted by the creature whilst playing in waist deep water on a ledge below the falls. With nowhere to go and the crocodile only a few feet away, Meadows panicked and attempted to swim to dry land nearby. She never made it. After swimming just a few metres, the hunter attacked, grabbing Meadows by the hips and dragging her below the surface, before briefly resurfacing. It’s said Meadows silently reached to the onlookers for help, but it was too late and in an instant the croc was gone. It took an expert search party two days to find the body; the croc had stored the armless body for a future meal. A mystery has persisted ever since the body was found: Meadows was rumoured to have been wearing a several hundred thousand dollar diamond ring at the time of the attack, but its whereabouts remain unknown. Is there a croc with expensive taste still working the banks of the Prince Regent River? 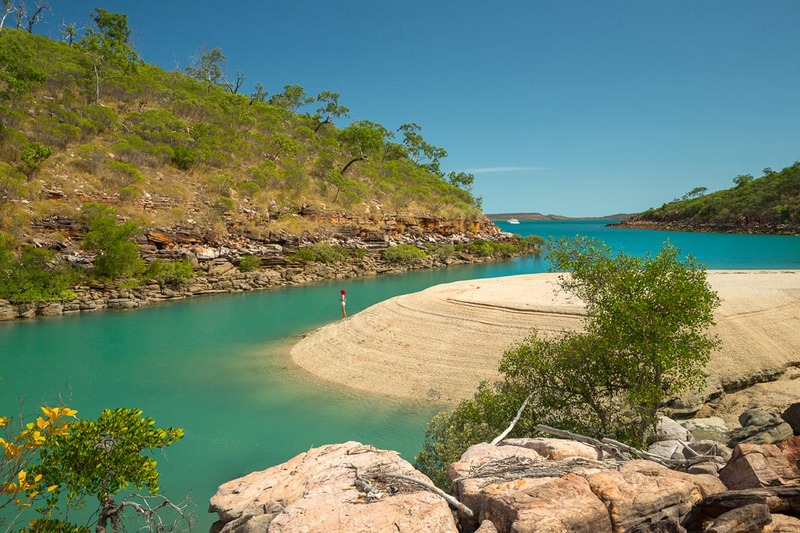 The contrasting colours and amphitheatre feel of Croc Creek make it one of the most glorious places to swim in the area, but it can only be done during certain tidal cycles, when the height/distance between the pool and seawater is sufficient that a saltwater croc wouldn’t be lying in wait. 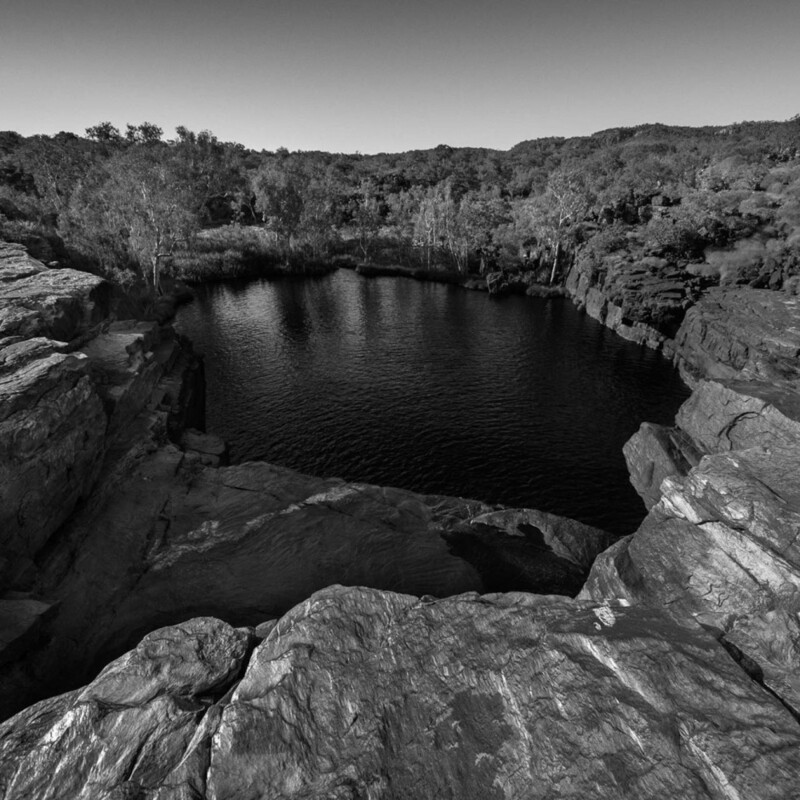 The crew advised it wasn’t safe on the day we arrived, so I climbed up the side of the small waterfall and had a dip in the totally safe upper billabong. 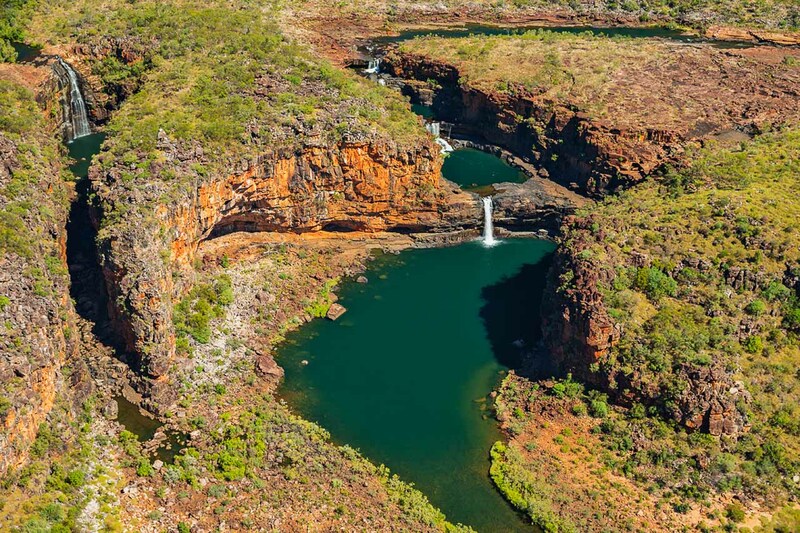 The Kimberley possesses a wealth of aboriginal art, the scope of which is found nowhere else in Australia. Perhaps the most fascinating and unique of all are the 20,000+ year old ‘Bradshaws’ or ‘Gwion Gwion’ paintings, that barely resembled any other indigenous Australian art I’d encountered and reminded me of pictures I’d seen in Papua New Guinea. 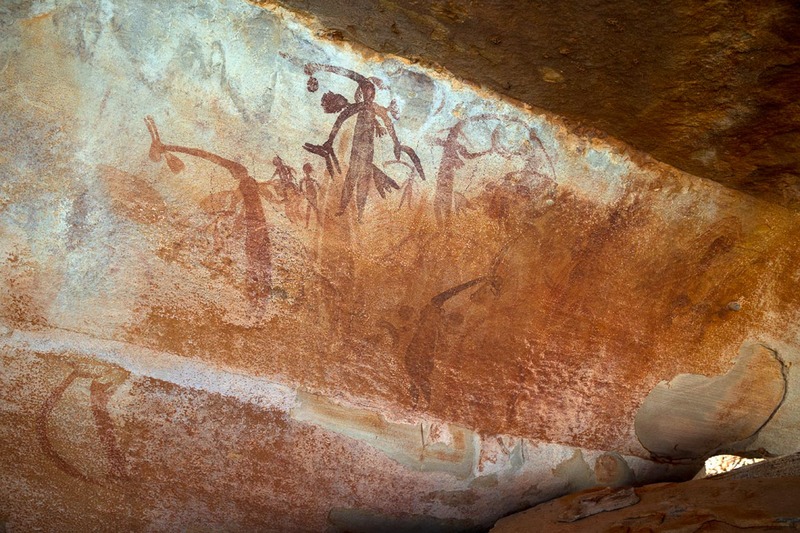 First discovered and recorded by pastoralist Joseph Bradshaw in 1891, the attribution of these paintings is hotly contested amongst archaeologists and rock art experts, with particular controversy sparked by Grahame Walsh’s research. 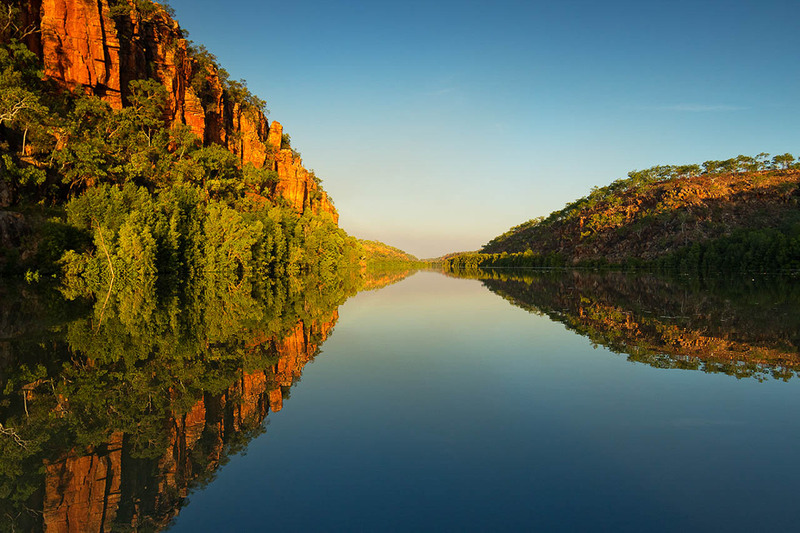 The formal identification of the creators could have far reaching implications with regards to native title claims in The Kimberley, which are hugely important as large mining companies and governments try to exploit the lands for myopic, finite financial gain. 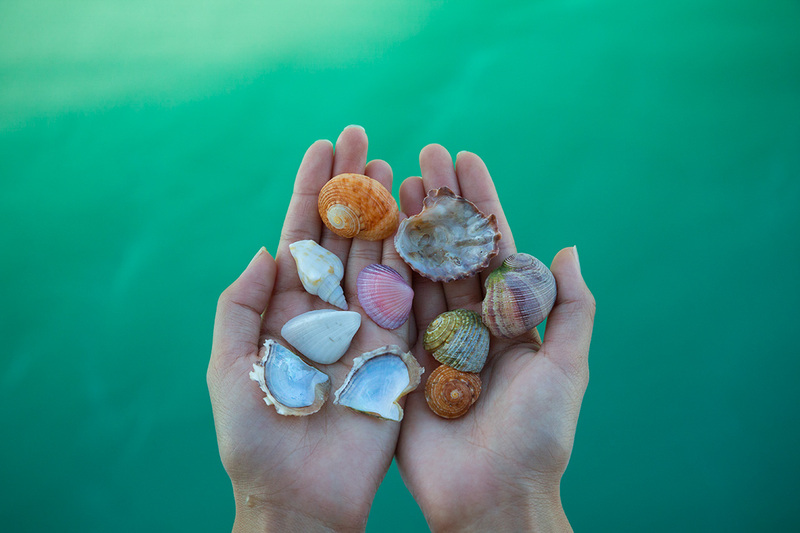 Beaches with no footprints except yours and a multitude of exotic shells underfoot? A patch of sand so remote that there’s a chance no human has ever stood there? 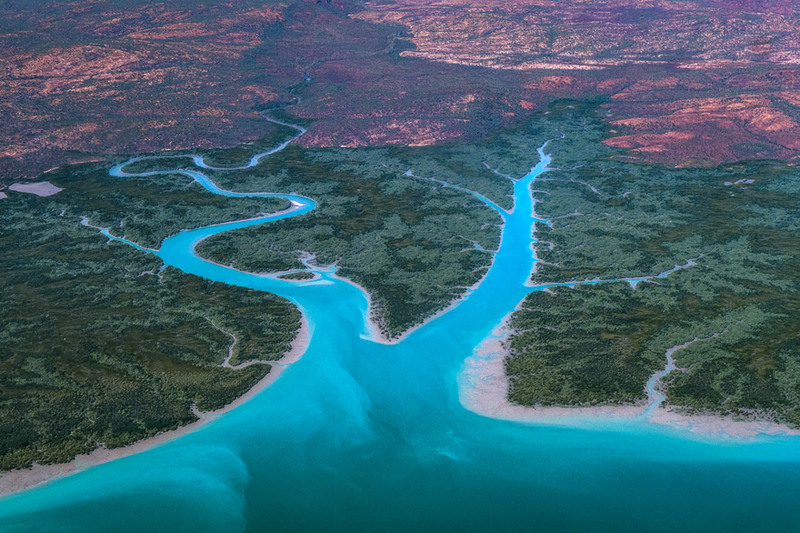 This is the reality of The Kimberley coast. I’ll admit this isn’t the clearest of pictures. 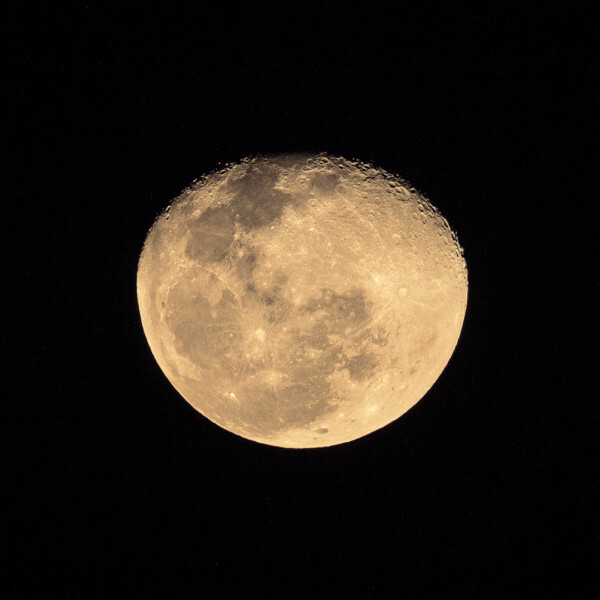 In fact, technically it has plenty of ‘digital noise’ from pushing the camera’s ISO to the maximum and it’s a little blurry because, even at maximum aperture (f2.8 on that lens), I couldn’t get an exposure decent enough, without the shutter speed being too slow for attempting a night shot on a moving boat. Generally I might let those details prevent me from making a picture, knowing that it won’t be quite what I want, but, let’s just say this scene brought such an emotional response, that I had to photograph it, even if the resulting image is somewhat ‘impressionistic’. 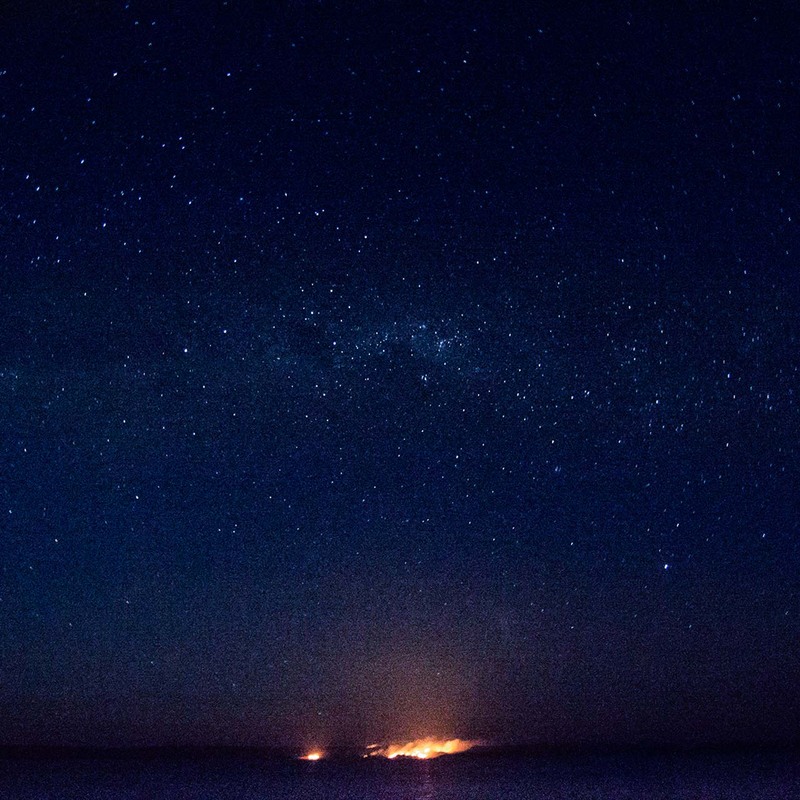 I came up onto the deck and was immediately reminded of a painting by Tim Storrier depicting fire under a blazing Australian outback sky that I’d seen as a kid. When I’d originally seen the painting it made quite an impression, but I couldn’t imagine stars so bright, or a night so free of light pollution, or the brilliance of the juxtaposing deep blue sky and orange of the fire and yet here it was, all of it, just like it had been in the painting and overcome by a sense of wonder I was immediately teleported back to childhood. 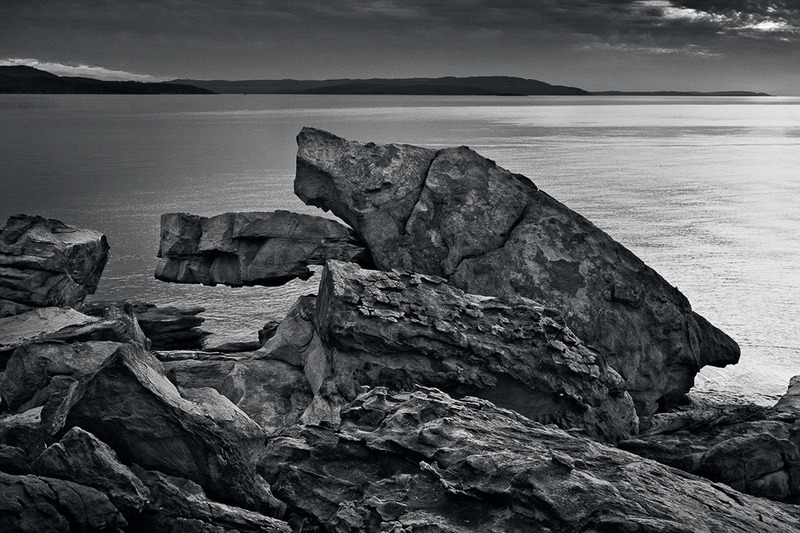 Raft Point is sacred to Aboriginal peoples and the site of much indigenous art. 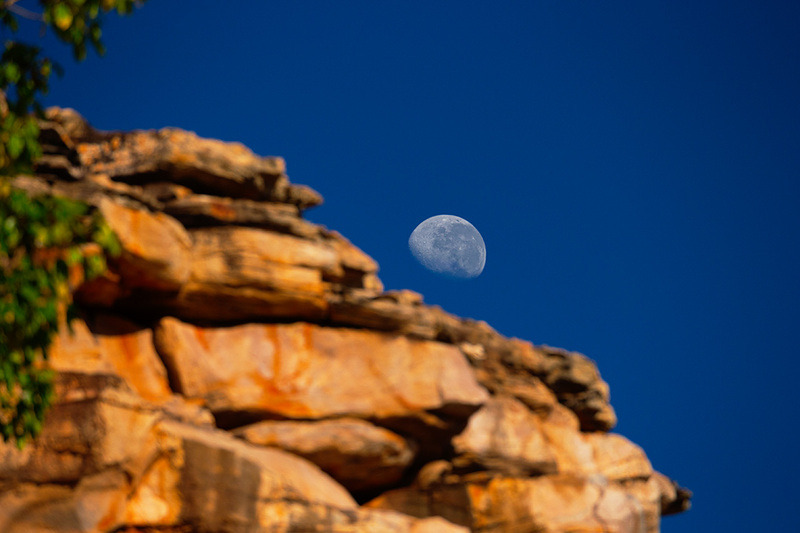 Spend a few days in The Kimberley and one starts to get a sense for a rhythm of the wilderness, the interconnectedness of it all, particularly the ebb and flow of the tides, so crucial for the mangroves and wildlife and of course the moon, pulling all the strings. The clarity of the skies facilitated plenty of lunar appreciation. The most cliché of subjects? 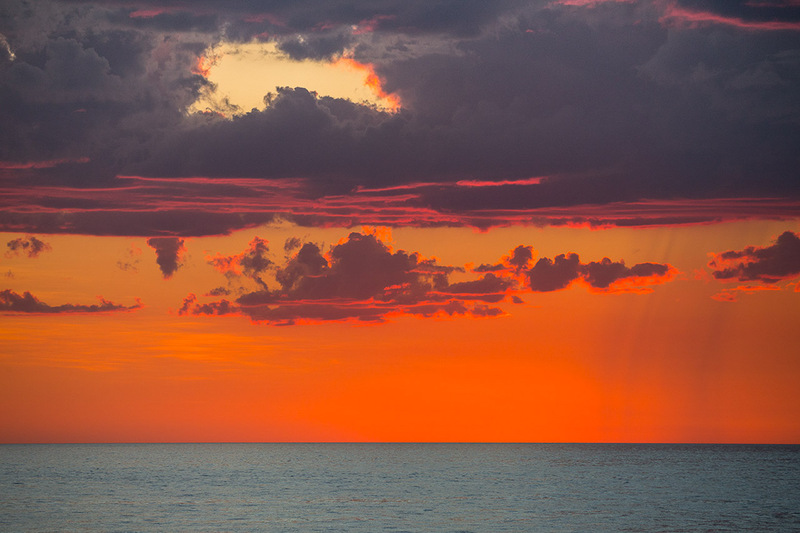 Very possibly, but breathtaking sunsets were an almost daily occurrence, there was something about the light and the vivid colour that I felt it would be remiss not to include such an integral part of the experience. 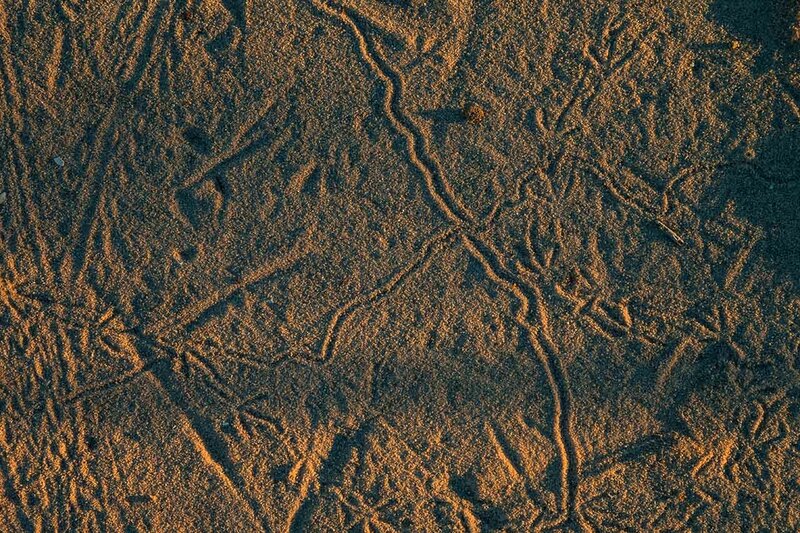 Trails and tracks in the sand at dawn, telltale signs of a busy night. 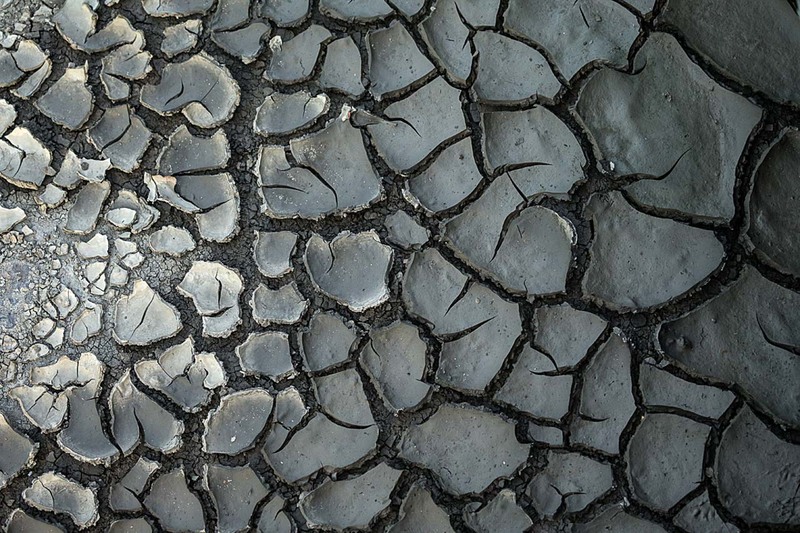 Drying mud pools signal the coming of the dry season. 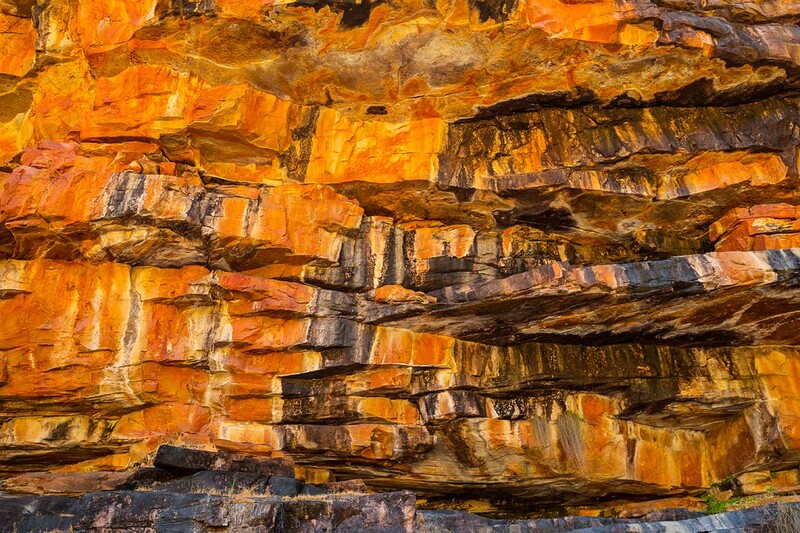 Ferrous rock colours and patterns. I observed many rocks impossibly balanced like this, a nod to the forces that shaped this landscape. Dappled, mercurial reflections of a sunset with moody clouds encroaching. 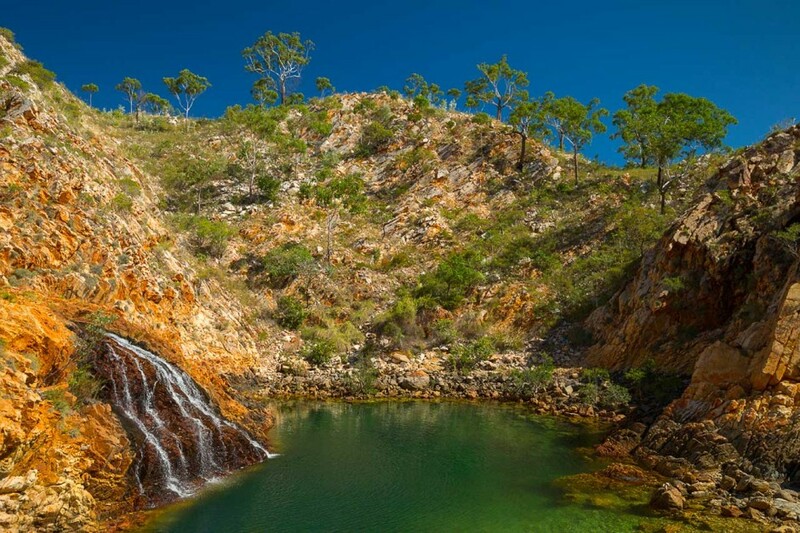 Turquoise waters, countless sandy bays, mangrove lined chalky-green hued inlets and the sensational Mitchell Falls (right) with Big Mertens Falls adjacent (top left). 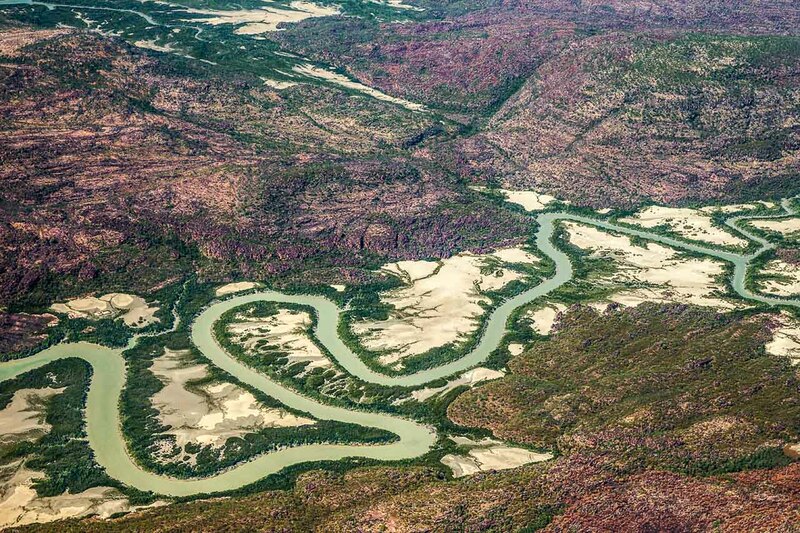 Rivers are one of the most stunning pieces of The Kimberley puzzle, invaluable to the indigenous peoples, who seemed to have an almost supernatural ability to visualise the landscape. Looking at the earth from the air, it was clear there could be no coincidence in their common deity, the creator god and giver of life, being the ‘Rainbow Serpent’. 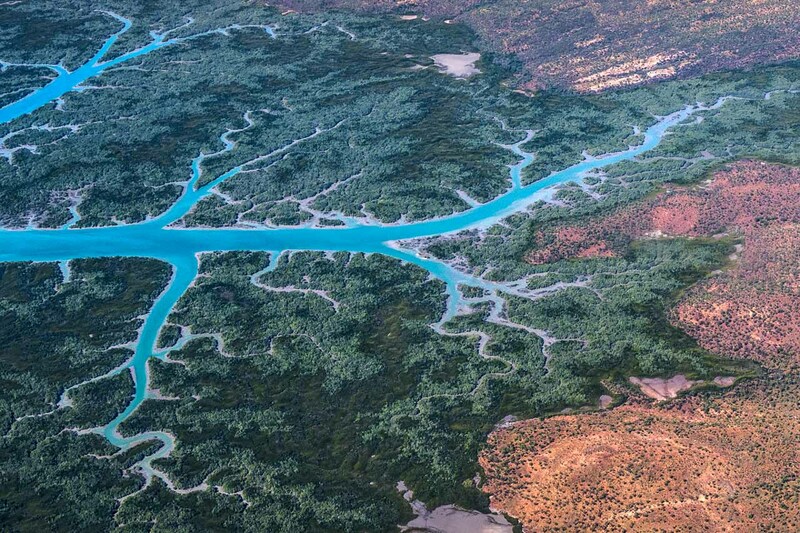 The snaking rivers are the giver of life, the lifeblood of the region. 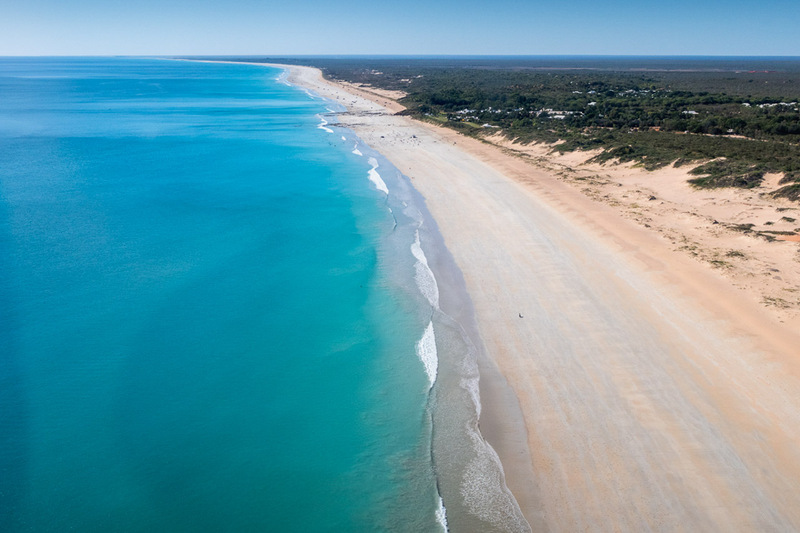 Cable Beach, Broome — This fabulous white sand beach stretches for 22 kilometres (13.6 miles), north from the town of Broome and received its name after the first telegraph cable laid connecting Broome and Java in the late 1800s. * Special thanks to Melissa Connell (@lifeintheslowlane), and the tireless crew of Odyssey: Mark Raissis, Dylan Mulherin, Liam Mattingly, Paige Quinn and Sam Belotti. You made the trip of a lifetime even more memorable, your unbridled dedication to meeting passengers’ needs and unwavering professionalism is second to none.